Product and ordering information for PS and PMMA Cuvettes. BRAND disposable spectrophotometry cuvettes; For wavelengths as low as 300nm; Available in macro and semi-micro sizes; Compatible with most spectrophotometers and photometers using a 10mm light path. 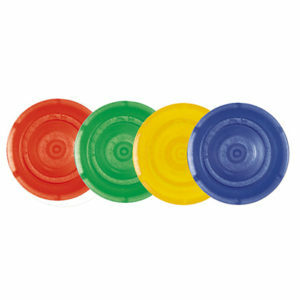 BRAND's plastic cuvettes are manufactured from the highest quality virgin resins for highest optical quality and are an excellent choice for most spectrophotometry applications in the visible range. Manufactured from polystyrene (PS) or polymethyl methacrylate (PMMA), they provide accurate, reliable results. Choose PS for determinations above 340nm, and where cost is a concern. When performing assays above 300nm, choose PMMA. (For wavelengths below 300nm, see our UV-cuvettes). 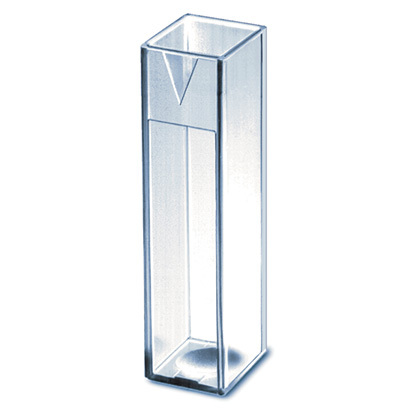 These disposable cuvettes are available in macro and semi-micro sizes to accommodate most sample volumes and are compatible with most spectrophotometers and photometers. All BRAND cuvettes are manufactured from scratch-resistant materials, and are grouped by manufacturing mold cavity number to ensure the lowest variation in extinction coefficient. What is the light path of the BRAND cuvettes? 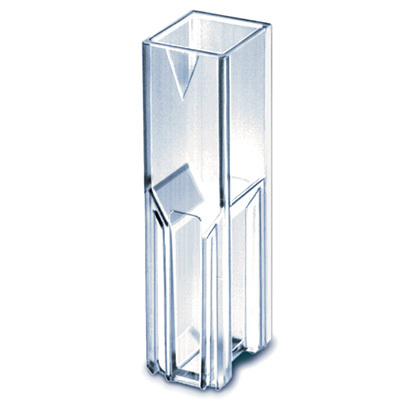 All BRAND cuvettes have a light path of 10mm. What is the difference between your PS, PMMA and UV-Cuvettes? Polystyrene (PS) cuvettes are the least expensive, however they have the lowest chemical resistance, and are only suitable for visible light applications, with a lower wavelength limit of around 340nm. 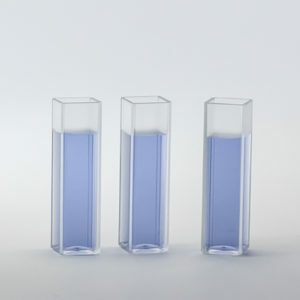 Polymethyl methacrylate (PMMA or "acrylic") cuvettes extend that range to about 300nm, or slightly into the near UV range, and have slightly greater chemical compatibility. BRAND UV-Cuvettes use a proprietary plastic to allow measurement as low as 230nm, and has resistance to many polar organics as well as many acids and bases. What does "mold cavity matched" mean? 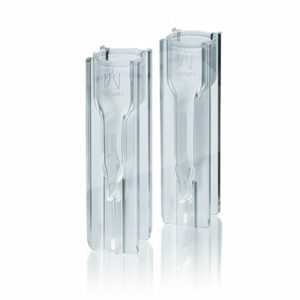 Cuvettes are injection molded plastic. No matter how close the tolerances are in the molds, there will be some variance. BRAND cuvettes are sorted during the manufacturing process so that each package of cuvettes contains only cuvettes made from the same mold, minimizing the cuvette-to-cuvette variance. What is the maximum temperature the PS cuvettes can tolerate? The PS cuvettes should not be used at temperatures above 70°C. What is the maximum temperature the PMMA cuvettes can tolerate? The PMMA cuvettes should not be used at temperatures above 60°C. Cuvette Rack - PP rack with 16 numbered positions.